The etymology of fiction is from fingere (participle fictum), meaning “to shape, fashion, form, or mold.” Any verbal account is a fashioning or shaping of events. Remembering and fiction-making are virtually indistinguishable. A year ago I aired David Shields’s original Port Huron Statement (apologies to The Dude) in my post “Against Narrative,” based on his speech, at a writer’s conference, that is the core of his cri de coeur, Reality Hunger. (Or maybe not a cry from the heart—Shields is an academic intellectual—but he’s incredibly passionate.) Now his book has the buzz and the mo. His broadside against tradition has its readers stimulated and annoyed, which surely was his aim. His preference for avant-garde forms reflects his sensibility but is an astute documenting of the continuing sea change wrought in postmodern life, especially by technology. I found Reality Hunger highly entertaining but its particulars somewhat forgettable—what’s brilliant is the concept. What’s controversial is its theme: traditional storytelling’s meaning-making apparatus is passé. 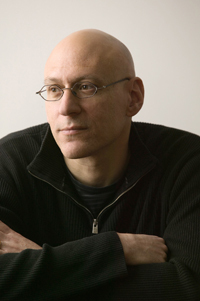 Mired in our manufactured and mediated and fractured environments, but equipped with recording devices, Shields says we hunger not for artificially cohesive narrative but for raw chunks of “reality.” (An interesting exception in the book’s nonlinear, though themed, format is his straightforward account of his own writing history.) His prescription is for art that’s contemplative, collaged, lyric, and documentary, for fiction in nonfiction, for any clever genre smashup. As the Oklahoma side of my family would say, Shields is peeing up a rope regarding narrative: he might as well inveigh against human sexuality: narrative is intrinsic to Homo sapiens. Non-narrative presentation is not only an advanced technique, it’s for a discerning audience. I learned this when I tried to teach some mulish college juniors—alas, not even English majors—to read and write lyric and collage essays. They were hardened criminals, that group. But still. They would have responded to narrative, and did when I finally recast the class in midstream. No, narrative’s not particularly intellectual, but it is satisfying because it conveys and shares subjective experience. As I’ve argued here, humans filter everything through the scrim of emotion—an essential part of our existential tool kit—so we’re curious about what another slob feels as he slogs through this valley of tears. Bringing us this news is what artists have always done. Interestingly, Shields is the son of journalists who wrote for crusading liberal magazines but who admired “real writers,” novelists. This unusually sophisticated intellectual household drove him toward the desire to be an artist. After serving as editor of his junior high and high school newspapers, he was fired from his college newspaper for making up stuff (a brave admission, though he’s wily enough to have invented the transgression as a land mine for the literal-minded). A manifesto seems to have been inevitable. And his Reality Hunger is fun, and in its way important. Shields’s lapse in this case aside, in the year since first hearing him argue that memoir isn’t journalism but literature—hence subject to latitude regarding literal truth in order to achieve Truth—I’ve come to agree with him (and Wolff, who makes the same point, if you think about it, with far less sweat). I hasten to add that I’m not condoning what James Frey did in A Million Little Pieces, a dishonest memoir that he’d tried to sell as a novel. His publisher wanted a memoir for sales reasons. There’s plenty of blame to go around. And yet much of the criticism from journalists was self-righteous or smacked of hypocritically protecting the nonfiction franchise. Anyway, hard at work on my own memoir in the intervening year, I’ve noticed how my memory actually works, how it melds events like dreams do. I’ve wondered how best to convey lived experience in order to honor the remembered, emotional truth of that experience. And I’ve read more acclaimed memoirs and, in re-reading the ones that really grabbed me, I’ve noticed how the writers have recreated experience. In the midst of this struggle I’ve also read more of what other writers have had to say. The most interesting and subtle thinking I’ve found was published by the travel-story site WorldHum, a 7,500-word essay on the “inevitability of fictionalizing in some forms of nonfiction” by magazine journalist and book author Tom Bissell. In “Truth in Oxiana” Bissell points out that there’s a difference within nonfiction genres regarding writerly authority. Think of a newspaper’s bare-bones yet subjectively selected details in its report of a public meeting vs. a magazine essay set on a typical day (that’s actually a composite of many days) vs. a memoir recreating someone’s internal reality and external experiences. “[W]e read a newspaper differently from a magazine, and we read a magazine differently from a book,” Bissell writes. “Our anticipation of the truth, and the many forms it takes, alters in regard to the conduit through which it reaches us.” But, for writers, he says, “the line between what is acceptable and unacceptable in nonfiction writing is clear and obvious” even as the “rigors of factual accountability shift subtly but undeniably from nonfiction genre to nonfiction genre. . . .
Let us be straight about this. There is no such thing in the brute, unfeeling world as a story. Stories do not exist until some vessel of consciousness comes along and decides where it begins and ends, what to stress, and what to neglect. Story, then, is the most subjective force in the world—but . . . I believe fervently in truth, particularly literary truth, and great nonfiction writers are men and women who work to find that truth and, through the force of their argument and their use of detail, convince us that truth exists. Great nonfiction writers are priests of truth, who, moreover, have to struggle to find it, because truth is often frightening or upsetting; it is almost always surprising. Journalists such as Stephen Glass and Jayson Blair believe they already know the truth, and write accordingly. They cynically manufacture detail to tell us what they already believe. A great nonfiction writer takes the lumpen stuff of human experience and transforms it into a truthful story that may not cohere exactly to what happened, because what literally happened is not always the best illustration of the truth. For instance, a newspaper writer tells us that two psychopaths murdered a family in Kansas. Is that the truth? Yes, but truth is many fathoms deep. Truman Capote, on the other hand, takes us into the lives of the murderers and the murdered, leaving readers flayed by the mysteries of human morality and existence. May I remind you that Capote’s In Cold Blood . . . was attacked for its numerous and, now, well-documented “mistakes”? . . . It is a misunderstanding to read a memoir as though the writer owes the reader the same record of literal accuracy that is owed in newspaper reporting or in literary journalism. What the memoirist owes the reader is the ability to persuade that the narrator is trying, as honestly as possible, to get to the bottom of the experience at hand. I would widen the lens even further to include much, but not all, of “literary journalism,” for literary journalism—the kind, at least, with aspirations toward art—relies not only on memoir but the protean fibers of experience as it is seen, heard, and felt. Experience can never be felt or described in the same way by two people. It is these human gaps that literature fills. Next: More on Reality Hunger, and how memoirists imagine themselves and their readers into the past. Inspired defense of narrative, Richard. I love how you point out how Wolff’s conclusion about memory is arrived at with far less sweat than Shields. So true. I look forward to reading Bissell’s essay — thanks for pointing it out. Brilliant post. It almost makes me want to read Shield’s manifesto, but I’ll wait for part II of your post before I dip in. Thanks, Beth. Bissell’s essay is superb. And Reality Hunger is a really interesting book, but whether it’s useful for a writer—other than for providing cocktail party conversation—I think depends on if s/he is working in or interested in experimental forms. But I think this whole argument confuses honesty with fact or even truth. If you remember something a certain way, you are being honest, even truthful. It’s like the movie we watched, The Final Cut. If you remember that the boat was green, it’s green. After all, your memory of that boat being green informed the way you lived your life. If you later see a photograph and discover the boat was red, then you owe it to your readers to call it the red boat, even if you want to say that you always remembered it as green. Your memories are all honest ones, whether they are factual or not. Every day that we remember something, the brain is reconstructing that memory. Think of it this way. You had an experience. After the experience, the paper was torn to shreds. To recall it, your brain reassembles those shreds. Each time you recall it, your brain reassembles them. Sometimes it puts another shred of paper from another memory in there or the colors merge with another. But it’s still honest. If memoir is called literature, that’s fine. But it’s still nonfiction. It still needs rules. Otherwise, how do we trust any nonfiction? I don’t grant you any leeway. I need to trust that your experience happened, even if time has eroded the memory. I like Bissell’s take on this very much, especially the pull of straightforward narrative among readers who may not be writers or those schooled in the virtues of more experimental forms. But I also think it’s important to distinguish between 1) the “fictionalizing” entailed in shaping a narrative or lyric essay; 2) the “fictionalizing” that memory does; and 3) the “fictionalizing” that constitutes making up facts, fully conscious that we’re doing so (otherwise known as pulling a James Frey). As memoirists, I think we have an obligation to attend to all three: 1) to do our best, most creative writing; 2) to be upfront about our unreliable memories, and to tell that remembered story as accurately as we can; and 3) to not make up facts. Being honest (emotionally, creatively, factually) and creating literature are not mutually exclusive. Nice way to clarify this issue, Tracy. Thanks for parsing the issues, removing some muddle.